Virtually unheard of a year ago, MP3—short for MPEG 1 Layer 3—is an audio-coding technology that allows digital music files from CDs or other sources to be compressed into a size practical for Internet transmission and PC storage. Whereas a typical digital recording of a song might take up 40 megabytes of space, an MP3 version will take up roughly 3.5 MB. Those same files can be downloaded in ten minutes instead of two hours (and even faster with the T-1 connections many universities and businesses have). As a result, music is a major Internet attraction. Brandenburg and others worked to make the compressed and then decompressed audio relatively faithful to the original. The researchers used Suzanne Vega’s a capella version of “Tom’s Diner” to listen for imperfections. Brandenburg claims he listened to the song between 500 and 1000 times during the development of the MP3 algorithm. This standard, named MPEG-Layer 3, involved technology developed by Fraunhofer, Thomson, and AT&T. At the same time, MPEG-Layer 1 and MPEG-Layer 2 were approved. Each involved different tradeoffs: Layer 3 had the highest quality audio and smallest file-sizes. Layer 1 had lower quality audio but was a less complex algorithm. Layer 2 was in the middle. Layer 2 received most of the initial attention: it was chosen as the audio standard for video compact discs and satellite radio, among others. Even the first internet site to offer MPEG-encoded files, the Internet Underground Music Archive, launched in 1993, initially used MPEG-Layer 2. Brandenburg said, “In 1992–1994, the main focus was to find companies who would really use this MPEG audio layer 3 and with the exception of some professional applications in the first year, layer 3 was out of luck. Everybody else decided to go with layer 2.”6 The Fraunhofer team began to believe that Layer 2 was winning because it was backed by established music industry companies Philips and Panasonic, that it was a political rather than a technical decision. There were a few early adopters: Microsoft bought a license in 1995 to use the spec, although the Microsoft applications at the time were not much used. Fraunhofer began to lose hope. Using MP3 for portable music was not an obvious use case: before 1995 the internet was not in widespread use, and where it was available, bandwidth was low. In the physical world, where digital music was delivered through the medium of a compact disc, compression was not needed. But Fraunhofer was willing to try anything, and portable music was one thing they tried. The problem was that no one wanted a player if there was no music, and no one wanted to make music in the format if there was no way to play it.8 It seemed the only way to get a critical mass of music in MP3 was to have the music industry embrace the standard. Without the cooperation of the music industry there seemed no way out of this chicken and egg problem, and the music industry—fat on CD reissue revenues and ever-wary of the potential for piracy—had no reason to cooperate. Fraunhofer had planned to license its patents to create encoding and decoding software. A license for the encoding software would be expensive and Fraunhofer assumed only large companies would license it. A license for the decoding software would be cheap and Fraunhofer hoped many products would be built around it and they would collect a small fee for each product sold. This vision—a few companies making recordings available to a large audience—had been the recording industry model since its inception, the typical mass-media model. The widespread illegal distribution of their algorithm made this business model moot, but the result was that the entrenched music industry players were no longer the gatekeepers to widespread use. In 1997 Micronas, a German chipmaker, released an MP3 decoder chip.13 A Korean company, SaeHan Information Systems (now TAK Information Systems) started buying the chips to build the first portable MP3 player, the SaeHan MPMan. The MPMan was introduced in Asia in early 1998. It cost 39,800 Yen (about $400 at the time) for the 32MB version, which could hold about six songs, and 59,800 Yen (~$600) for the 64MB version.14 The design was licensed to Eiger in mid-1998, who distributed it in North America, selling the 32MB version for $250. The Diamond Rio, also with 32MB, quickly followed in September 1998, selling for $20015, and then a slew of others. The first MP3 players used flash memory. This made the players portable but limited their capacity. Some later players used hard drives to hold the music. These had much higher capacity, but were larger, heavier, and more expensive. The HanGo Personal Jukebox, for instance, cost $799 when it was introduced but had almost 5GB of storage. At 6x3x1 inches, it was unwieldy for a handheld. Solutions that were both high-capacity and small, like the I2Go eGo, cost about $2000. Other innovations included expandable memory, longer battery life, ability to record voice (all three of these were included in 1999’s RaveMP), radio reception (1999’s Nomad), better sounds (2000’s Nomad), better user interface (Apple’s iPod), video support (2002’s Archos Jukebox Multimedia), etc. The MP3 standard was not the technically best compression algorithm. The AAC format—created by Fraunhofer and introduced as an MPEG standard in 1997—was better (and later used by Apple), as was the open-source Ogg Vorbis format, released in 2000 and free to use (it is now used by Spotify, among others). Microsoft introduced their own format in 1999 (WMA), perhaps to avoid paying Fraunhofer licensing revenues. But players that bucked the increasingly popular MP3 standard had a hard time gaining any traction. Sony joined the digital audio player market in 1999 with their Vaio MP-P10 Music Clip. Despite its innovative design and small size, it did not natively support MP3 (it used Sony’s proprietary ATRAC3 format and included MP3 to ATRAC3 conversion software) and was a failure. Sony tried again in 2003 with the NW-MS70D, but it also did not natively support MP3 and failed. It was not until 2005’s Sony NW-HD5 that Sony released a player that supported MP3.16 The same problem that had dogged MP3 in the beginning—no one wanted to introduce a player that had no music and no one wanted to encode music in a format that no one could play—now worked in MP3’s favor: if all of your music was already in the MP3 format, why would you buy a player that used a different one? Home taping did not end up killing music, but the recording industry has never not been paranoid about piracy, the illegal copying of music for distribution. Music piracy was not invented by MP3 aficionados, but the combination of perfect digital copies and worldwide, instant internet distribution made the problem several times more acute. Cassette tapes meant for audio storage were introduced in the 1960s. Early sound quality was poor, but advances in technology meant that by the early 1970s, cassette tapes rivaled eight-track tapes in sound quality. Not coincidentally, the International Federation of the Phonographic Industry pushed through the first anti-piracy measure, the Geneva Phonograms Convention, in 1971. During the recession of the late ’70s and early ’80s, the IFPI tied the decline in record industry revenues to the increased sale of cassette tapes and recorders. But the possible impact of tape recording on record sales was fundamentally limited by the technology: a tape had lower quality than its vinyl source, a tape of a tape lower still. The distance between the listener and the original purchaser could not be high. Regardless, the IFPI estimated piracy at 11% of the total market in the US and Canada in 1982 and higher elsewhere. So when consumer digital audio recorders started to become available in 1987 with the release of Sony’s Digital Audio Tape (DAT) standard, creating the potential for flawless duplication, the recording industry pushed back: the Recording Industry Association of America (RIAA) began lobbying for legal protection. The result, in the US, was the Audio Home Recording Act of 1992 (AHRA) that, among other things, mandated a Serial Copy Management System to be built into all digital audio recorders. This SCMS chip prevented second-generation recordings. AHRA also levied fees on DAT recorders and blank media to be distributed to the existing recording industry. This crippled the market for DAT and it never caught on among consumers outside of Japan. The personal computer industry successfully lobbied to have personal computers exempted from AHRA, not a huge concession at the time given how small the PC market was. Five years later, the cheap availability of both encoding and decoding software and the exemption of PCs from AHRA laid the groundwork for the growth of MP3s on PCs. Early digital audio enthusiasts were limited because without widespread access to CD burners and with no MP3 players yet on the market, songs had to be listened to on a desktop computer, they could not be played in the car or while running, or anywhere else that people listened to music. And the rarity of high-bandwidth consumer connections to the internet in the 1990s meant that even a 3 MB MP3 file was difficult and time-consuming to share. CDs were still a better way to consume music. But when the Diamond Rio MP3 player came on the market in the Fall of 1998, this all changed. The RIAA decided to nip the phenomenon in the bud. The Rio had no SCMS chip, and the RIAA contended that it thus violated the Audio Home Recording Act. But by June of 1999 the courts ruled that since the Rio was only a storage device, not a recording device, it did not fall under the Act. Between the exemption for PCs and the failure of the RIAA to prevail in the Diamond lawsuit, the MP3 player market was entirely legal.17 In fact, the publicity generated by the lawsuit seemed to spur MP3 player sales. The RIAA was not done yet. Unable to regulate the devices themselves, they went after the distribution channels. 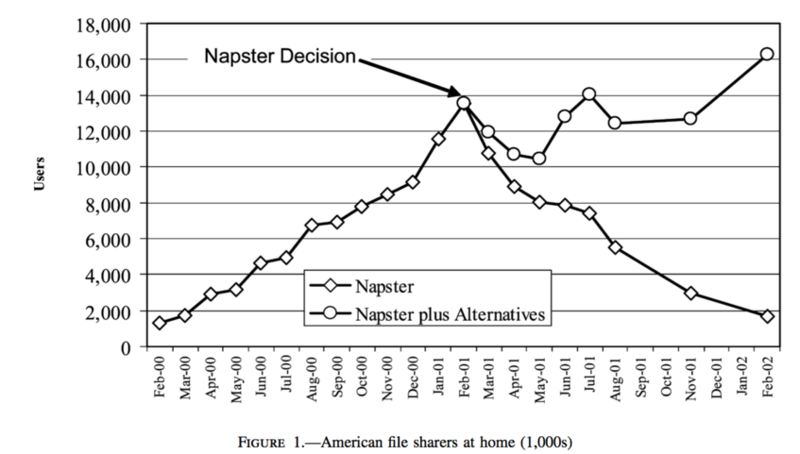 By 1999 the largest source of “shared” MP3s was Napster. 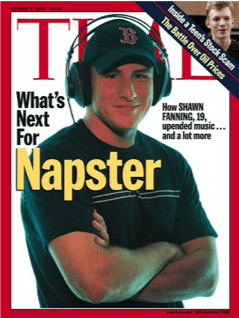 Napster was developed by Shawn Fanning, a college student at Northeastern University. Released in June 1999, Napster allowed its users to find MP3 files on other users’ computers and make copies of them over the Internet. 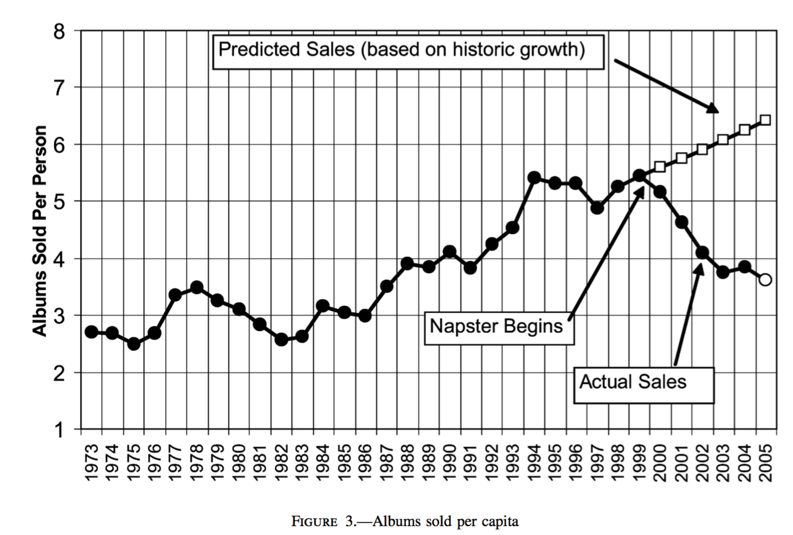 The number of Napster users started to grow rapidly soon after its release (see Chart 1) and it quickly became a phenomenon. Time Magazine put Fanning on its cover in October of 2000. A preliminary injunction, essentially shutting down Napster, was granted in February 2001 and Napster usage declined rapidly. But other file sharing systems quickly took its place. This new generation of file sharing sites like Limewire, Grokster, and Kazaa and file-sharing protocols like gnutella, FastTrack, and BitTorrent did not have central servers for indexing and peer discovery, as Napster did. They could not easily be shut down by court order. 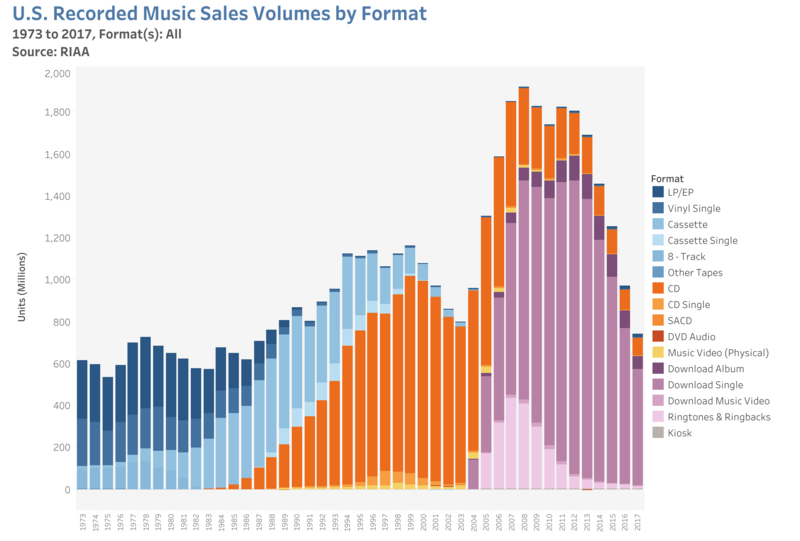 Album sales fell precipitously.22 In response, the RIAA began to sue individual file sharers in 2003. While a publicity disaster, this effort arguably seemed to have some impact on file-sharing (see Liebowitz, op cit.) 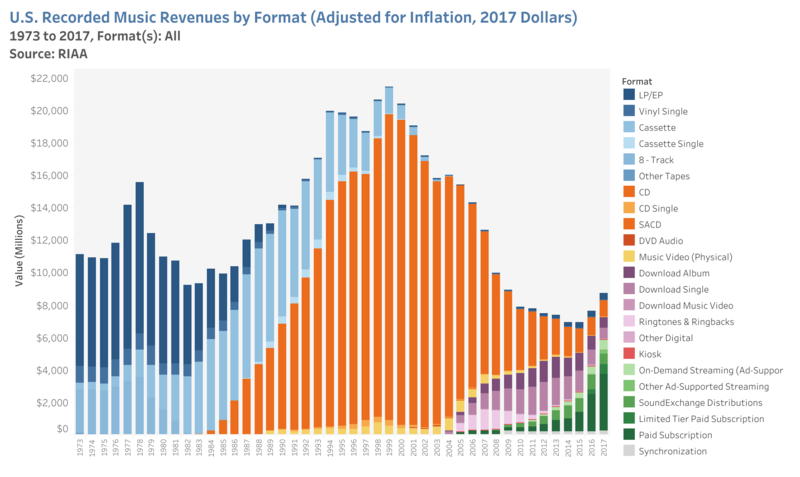 but industry revenues did not respond. With many people, some in the record companies themselves, saying that file-sharers obtained digital music files illegally because there was no legal alternative, the record companies tried, starting as early as 1998, to provide an alternative to MP3. They formed the Secure Digital Music Initiative (SDMI) to provide digital watermarking so that shared files could be traced back to the source. Also in 1999, RealNetworks announced their RealJukebox software. RealJukebox ripped CDs and allowed users to download songs from the Internet. It used DRM technology built by AT&T and IBM. The record industry was not supportive of Real either. RealJukebox still allowed the user to play MP3 files; RealNetworks had tried to please both the consumers–by supporting the leading format–and the record companies–by supporting a DRM format. As a result, neither was impressed. The record companies had placed their hopes in the SDMI initiative. But the SDMI was unable to meet the technical challenges of creating a secure audio format and could not convince the hardware makers to go along with it. The SDMI made no real progress and seemed to disappear by 2001. Instead the record companies tried to launch their own digital music services. Digital music is such a great idea that even record companies finally, begrudgingly accepted it after years of implacable opposition. In 2002, two online services backed by music industry giants proposed giving consumers a legitimate alternative to illegal file sharing. But the services’ stunningly brain-dead features showed that the record companies still didn’t get it. PressPlay charged $15 per month for the right to listen to 500 low-quality audio streams, download 50 audio tracks, and burn 10 tracks to CD. It didn’t sound like an awful deal, until you found out that not every song could be downloaded, and that you couldn’t burn more than two tracks from the same artist. MusicNet cost $10 per month for 100 streamed songs and 100 downloads, but each downloaded audio file expired after only 30 days, and every time you renewed the song it counted against your allotment. Each of the services had music just from its own backer labels, so subscribing to one meant the user only had a 50/50 chance of hearing the song they wanted. The services were never widely used and the record companies abandoned them in 2003. At the turn of the century Apple had a problem. 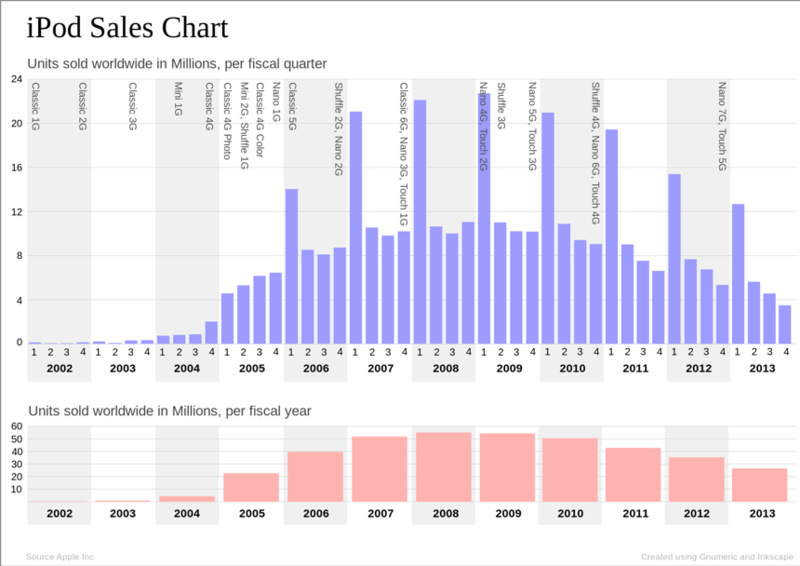 The personal computer had become a commodity; Apple’s revenue had fallen from its high of $11 billion in 1995 to $5.4 billion in 2001 (see Chart 5). But Steve Jobs had a vision. Apple’s mission would be to make the personal computer the “digital hub” of the home. Televisions, stereos, cameras, and any other device that processed digital information would connect to it. Photos, videos, and music would come and go from the computer to all these ancillary devices. Jobs was a notorious micro-manager. For any new product to meet his exacting standards Apple needed to control it. If Apple computers were to be the centerpiece of the digitally connected home, then Apple would have to write the software to run the connected devices, and even make the devices themselves. Apple would be end-to-end. Jobs’ desire for control was more than perfectionism, it was strategic. He knew that one of the primary customer complaints about personal computer peripherals—any devices, even devices like printers whose entire purpose is to be connected to computers—was that they were difficult to get working. By owning the entire end-to-end system, he could make the experience seamless. Also, if much of the functionality that was on the device (editing, organizing, managing storage) was done on the computer instead, the device itself could be much simpler and more elegant. The first piece of this strategy was video. Between the FireWire interconnection standard, iMovie, iDVD, and a DVD burner, Apple users could make their own movies. Apple did not need to make camcorders because they judged those on the market to be sufficiently good already. The next piece would be music. Jobs saw the popularity of CD burners and how the existing digital music software was so bad it was holding back the market. In July 2000, Apple negotiated an exclusive license for SoundJam, software written by ex-Apple engineers and distributed by small publisher Casady & Green. Apple hired the SoundJam developers to turn it into a Rio music manager for the Mac. Jobs worked with the SoundJam team to strip down the software and make it simpler. In January 2001 the software, renamed iTunes, was launched. Unlike camcorders or digital cameras, the Apple team did not like the existing MP3 players. They were either small with too little storage, or large and clunky. The only ones they thought were any good were the ones based on the new 2.5-inch hard drives from Fujitsu. But they all used USB to transfer music at a much slower rate than FireWire, had awful user interfaces, and minimal battery lives. Apple started to look into making their own. Jon Rubenstein of Apple was in charge of building it. He found the right screen and the right batteries. Then in February of 2001 he visited Toshiba in Japan where they showed him their new 1.8-inch hard drive. They had no idea what it could be used for. Without letting Toshiba know what he planned to do with them, Rubenstein negotiated exclusive rights to all of the 1.8-inch drives they could produce. Apple built very few of the iPod’s components: the reference design was licensed from a small company called PortalPlayer, the iPod operating system from another small company called Pixo, off-the-shelf parts included a battery from Sony and chips from Texas Instruments. An Apple engineering team integrated the pieces. The challenge was understanding and engineering around the deficiencies of the existing players. For instance, to extend the battery life, Apple created a 32 MB memory buffer so the hard drive could be spun down until needed. The device itself was designed to feel solid, not a cheap plastic toy like its competitors. And the user interface was simplified to its bare essentials: the scroll wheel. Any functions too complicated for the scroll wheel, like making playlists, could be done in the iTunes software. The iPod was introduced to the public on October 23, 2001, with 5GB of storage and priced at $399. It only worked with the Macintosh, less than 4% of the U.S. computer market at the time.28 By the Summer of 2002 the price for the 5GB model had come down to $299 and a 10GB and 20 GB model were introduced. The next step was to get rid of the clunky process of getting digital songs. Buying CDs and then ripping them seemed inefficient. The existing digital download sites (legal and illegal) were inelegant or incomplete. Jobs wanted to build an iTunes store. As part of the SDMI initiative, executives from AOL Time Warner came to Cupertino in January 2002 to ask Apple to be part of their consortium. They began their presentation to Jobs and got four slides in before he interrupted them by telling them, in his inimitable way, “You have your heads up your asses.” Steve Vidich, the AOL Time Warner lead, gamely replied, “You’re right. We don’t know what to do. You need to help us figure it out.” Jobs agreed to work with them. Seeing the label-initiated stores fail, Jobs decided to build his own. He knew he needed to convince the labels, all of them, to let him offer their music for it to succeed. Apple wanted to sell each song individually for $0.99. Apple would keep 30%, the labels would get 70%. The price was about right, but the labels balked at selling songs individually: they had built a business selling whole albums on the back of one or two good songs. Jobs had two good arguments to use with the labels: because iTunes/iPod was end-to-end, Apple was in a unique position to prevent piracy through effective DRM; and the Macintosh installed base was so small that if the experiment did not work, then little harm was done. While Microsoft ended 2000 with $23 billion of revenue, nearly 40,000 employees, and a market capitalization of $231 billion, Apple was comparatively tiny, with revenue of $8 billion, fewer than 9,000 employees, and a market cap of $5 billion.29 Apple was hardly the threat Microsoft was. Jobs convinced all of the labels except Sony. As a hardware maker and a record-label owner, Sony had hoped that they would be the end-to-end provider. Eventually, once all the other labels had signed on, Sony felt obliged to follow. On April 28, 2003, Apple unveiled the iTunes Store. It soon became clear that the system was popular with customers and Apple decided it needed to broaden its market. In October 2003, after another round of negotiations with the labels, Apple announced iTunes for Windows.